A bit of a rarity has resurfaced over at Yahoo Japan auctions. Collectors who missed out this gem all those years ago may yet have their second chance. Yes, the elusive Famicom Box version of Rockman 1 has returned! 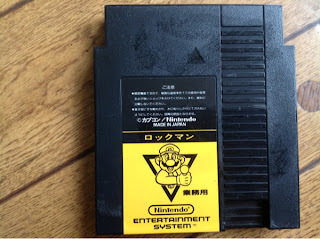 This version of the game was produced specifically for Nintendo's Famicom Box system: a multi-game unit predominantly found in hotels in Japan that utilized special cartridges on a pay-per-play basis. The big draw for collectors is the cartridge itself. It uses American-style casing (in black, no less) with 72-pin connectors. Technically, you could play it on an American NES. More over, the game is exactly the same as the Japanese retail version. You won't find anything new or diferent here. So, really, this item is probably better suited to the most die-hard and fanatical of collectors. Bidding begins at 6,000 Yen ($75). Unless you're in Japan, you’ll need to secure the services of a proxy such as Rinkya, who will bid on your behalf, albeit for an additional price.